The Australian consumer rights organization CHOICE recently conducted an undercover investigation of the gym/fitness center/health club industry. CHOICE sent two secret shoppers into 9 different gyms in and around downtown Sydney posing as potential new members. Our second shadow shopper said: “He just kept asking me what the problem was.” At two of the four visits to Fitness First outlets, our shadow shoppers reported difficulty in ending the consultation – something they did not experience at any of the other gyms. I have been in this business for years and I have worked with some pretty shady salespeople…scumbags really. They are a big part of the reason why I started my own personal training business and why I recommend people stay far away from any health club chains. Go gym shopping at the end of the month – all salespeople have quotas to fill. Take control of the sales meeting – Once they get talking, you are more likely to get hypnotized by their sweet words. Try this approach…. After you have had the grand tour and have been ushered back into the salesperson’s office…tell them that you ARE going to buy a gym membership in the next couple of days. Not maybe. Definite sale. You just need to decide which gym is best for you. This way, you avoid the speech about how important it is to exercise, yadda yadda. Then tell them that what you need is their absolute best price. They will try and get you to stay seated and listen to some more B.S., but you won’t. Tell them that you have an appointment in 20 min with one of their competitors. Request their “best price” again. If they hesitate, stand up and head for the door. Don’t worry, they won’t let you walk out that door. Take their “best price” and head to the next health club on your list. Always be prepared to walk out that door. Don’t worry about hurting their feelings. They’re salespeople, they don’t have any feelings. Don’t believe me? See Alec Baldwin in Glengarry Glen Ross. One thing most of the gyms had in common was a creative approach to pricing. Some had printed prices, others handwritten only, but ultimately all seemed to have flexibility in the discounts and incentives they offered. Costs such as joining and administration fees were magically waived or halved as an incentive for our shadow shoppers to sign up. One Curves consultant and one at each Fitness First outlet even asked leading questions to ascertain how much our shadow shoppers could afford to pay. In the case of one Curves outlet, one shopper was told she couldn’t take the handwritten prices away with her, as a matter of “company policy”. Fitness First National Operations Manager, Michele Harding, concedes the pricing structure varies from club to club, depending on customer demographics and location. Fernwood Sales Manager, Jo Stagg, says prices across the Fernwood network also differ depending on location, as franchise owners set their own prices. Our shadow shop revealed that while both Curves and Contours had consistent pricing across their outlets, there were variations in what was waived or charged in terms of joining and administration fees. One Curves outlet quoted a joining fee of $30, while at another it was $199 but a $99 discount was offered. At a Contours gym, one of our shadow shoppers was quoted a “set-up” fee of $195 for a 12-month contract which was reduced to $95, then an “admin fee” further reduced to $45 during the consultation. At the same gym, our other shopper was told this joining fee would be waived totally if she joined before a certain date. At the second Contours gym, a set-up or administration fee was not mentioned to either shopper and they were both told that the “joining fee” would be waived if they signed a 12-month contract. 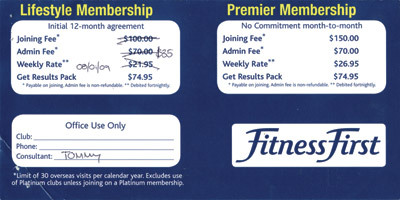 Add up all of the different charges to determine what the total cost of a 12 month membership actually is. They will try and trick you by dividing the total cost up into a bunch of different smaller charges. Be prepared to walk out the door. We have all heard the horror stories of people trying to cancel their gym memberships. Threats of legal action for breach of contract. If you need to cancel your membership, do it in writing, in person, at the gym, with the club manager. I knew there was another reason why I never joined a gym and do Krav Maga instead! Is Krav Maga a good workout? Perhaps the women were asked “leading” questions at Curves because they offer different plans for different circumstances: special rates for students, additional discounts for teachers, nurses, brides, new moms, etc…, no membership dues for those whose health insurance will pay for it; sliding scale for those who need to workout for confidence/stress management because they are looking for work. Curves is for women who are more likely to enjoy exercising and staying with it when they feel a connection to the club, staff, and other members. The “sale” process is where that relationship begins. EVERYONE should read a contract before signing. Curves has a buyout provision written in. Not what i would call shady. Gym memberships are headaches. I’m in the process of looking for a new gym because the one I am with is just not convenient to my schedule and location. I went into national gym and did the whole tour thing. When they sat me down with the price and showed me the contract to sign I asked them if it was possible if I could take the contract home with me to read it since I didn’t have time. I couldn’t believe it when they refused to let me leave their office with it! Or they could do like the gym down the street from me did- keep taking membership money and then when you show up the next day to work out the doors are closed and the building is empty. How do you stop the direct debit at Contours gym after 12months is up? If you were in the States or Canada, I would say contact your local Better Business Bureau and get their help. they’re the experts. But I don’t think the BBB operates in Australia. Try calling one of these organizations and see what they say. They should be able to help. I’ll learn Monday if my club gets to keep all the monthly dues they deducted after we quit. We were working out with the owner virtually everyday. He knew we were quitting to go to school. The first month after we left, no credit card deduction. We were done, right? 16 months later we realized he was back deducting. His claim: didn’t follow contract requiring written termination. Ethical dude, huh? I have experienced the same but I always use those free trial offers at least this way you could test it yourself on how good their facilities are. I just hate those that are very aggressive. I do so many gym trials, I get bored and like to change often (that said I’ve been with my current gym more then a year now and thats out of personal choice!). I make it clear when I try out a gym I will not be walked over. Glaring people right in the eyes, stating that “I do not like being pushed into things and am likely to walk if I feel I am being pushed into anything” (or words to that effect). I dislike game playing and make this clear. I like the smooth way you describe getting a better contract above but to be honest I am not good at things like this as I prefer to get right to the point straight away. I have a cost in mind, if its over that (which it invarably is) I walk. I have walked several times. I went to Virgin Active, they did have a print-out costing list, membership registration/admin fees were able to be waved as I’d expected and I was allowed to take the list home with me to think about. Others on other websites were given the same price, discounts via the team were not allowed incase it caused member unrest so although I had a voucher, I had to actually bring it with me for it to be considered otherwise it was full price (I got 3 months free). Seems transaprent enough for me anyway. LA Fitness seemed to offer this and that off, freebie bag and towel but would not reduce the price per month. Fitness First didn’t even bother to try talking me into anything. I did the glaring thing when the guy tried as well as looking at my watch and making it clear I was there for a workout not for a chat. I have no idea if they were going to reduce the cost. An additional thing to try is to mention that you have had a contract with a really fantastic and very expensive gym, that your now looking to reduce your costs but are not sure: you have high standards of hygiene and would need to check the gym out properly. (I did this not because I was trying to buy time but because it was true). I have been let down 4 out of 5 times. My local gym and fitness first being on a par with lack of cleanliness. I would have been happy to discuss this with the manager had I been asked but funnily enough within my 7 day trial no one asked. Insted I went to my doctor after I caught a mysterious and rare (says doctor) bug. I had previously not been ill for years.